The Shane Adaptive Optics (AO) system is used at the Cassegrain focus of the Shane 3-meter Telescope. It can be used in either natural guide star (NGS) or laser guide star (LGS) mode. The AO system routinely reaches the diffraction limit (0.15") at 2.2 microns. NGS mode requires a natural guide star brighter than 13th magnitude under normal conditions, within 10" of the science target. LGS mode requires a natural guide star brighter than 17th magnitude for tip/tilt correction, within 60" of the science target. Laser operations are also restricted to elevations greater than 45 degrees. Typical lasing hours are 10pm to 5am local time due to air traffic from the regional airports, but a different 7 hour block of time during the night for laser operations may be requested well in advance of one's observing run. 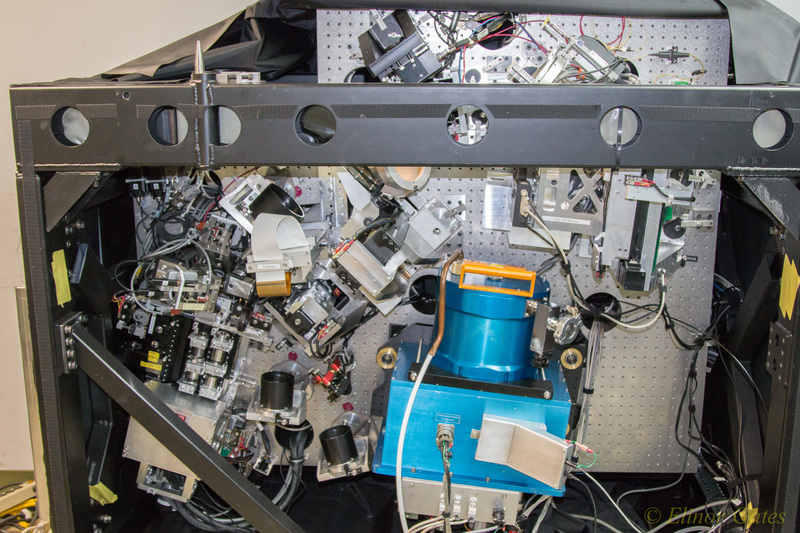 The AO system feeds ShARCS, an AO-optimized IR camera that uses a H2RG array which is sensitive from 0.9 - 2.5 microns and provides Nyquist sampled imaging at 1 micron (0.035 arcsec/pix). The internal image quality is excellent over the entire 20 arcsecond field of view. ShARCS is equipped with standard near-IR photometric filters and some narrow-band filters. User supplied filters can be installed in a warm external filter wheel. ShARCS also has grisms for medium resolution (R=500) H and K spectroscopy. The system became available for use as a science instrument by the UC community during Spring 2014. It is recommended that new AO users contact Elinor Gates egates@ucolick.org prior to proposal submission so that we can be sure you have enough information to assess whether adaptive optics is feasible for your observations.